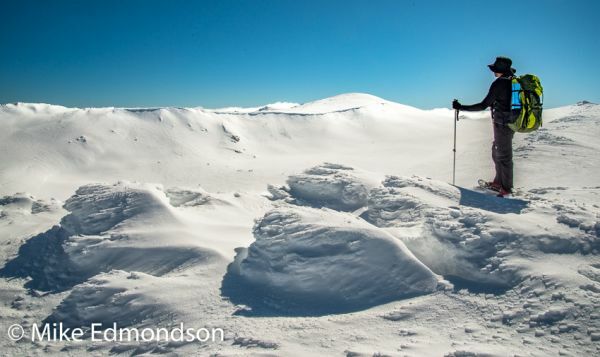 On SNOWSHOES which are ideal for first timers. 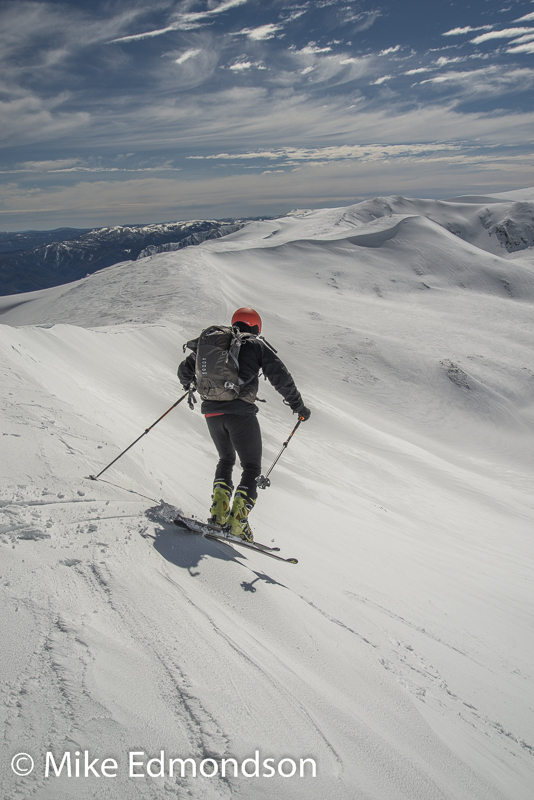 Or on ALPINE TOURING SKIS, CROSS COUNTRY SKIS or SPLIT BOARDS for more advanced siers & boarders who have used the the equipment with Mike on day trips first. 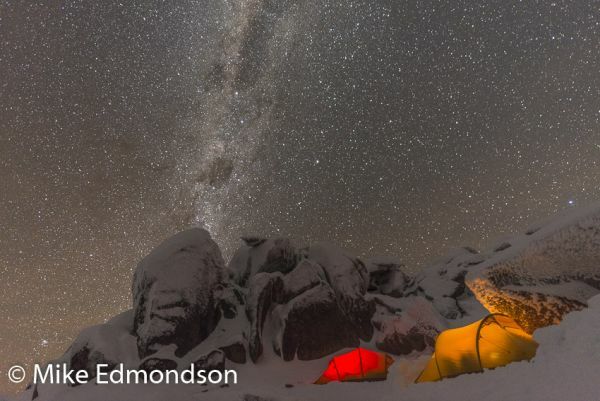 Treat yourself to an overnight adventure in the snow and experience the wild beauty of the winter alpine environment including a trip to the top of Mt Kosciuszko at 2228 metres! 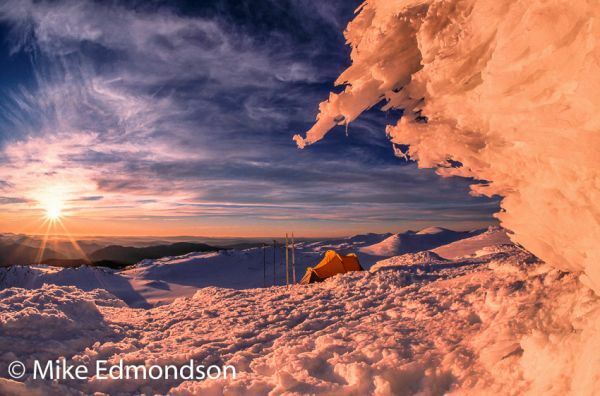 Camping provides a unique opportunity to watch the sunset over snow covered mountains before you settle down for the night in your warm four season sleeping bag. 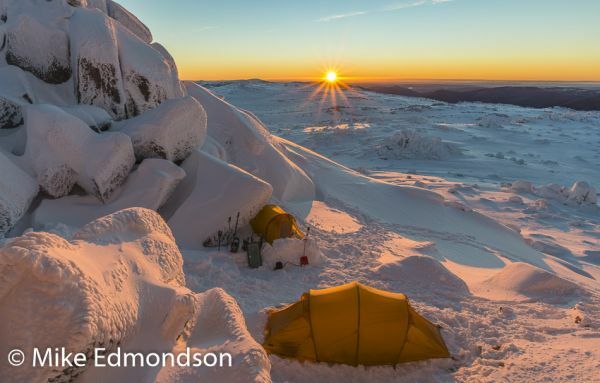 You will learn essential skills for the wilderness: where and how to set up camp, building a snow shelter (conditions permitting), how to cook a hot meal and drink, navigation, group management, hydration and how to prevent hypothermia. Group sizes are small - no more than 6 people. This ensures that Mike can spend time with each of you, focusing on your individual needs, interests, and skill levels. 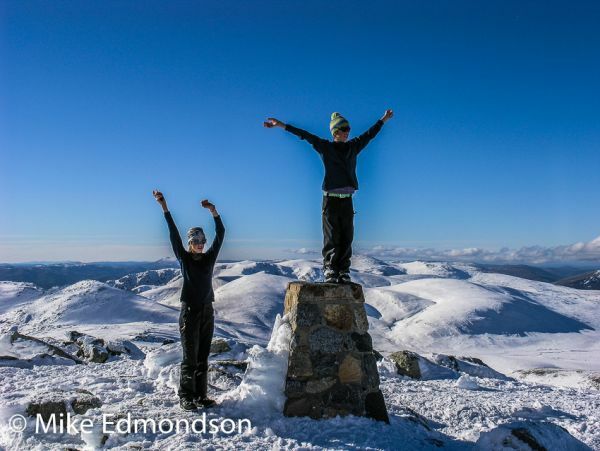 From skiing spectacular untracked runs to visiting favourite rocks & scenic lookouts. 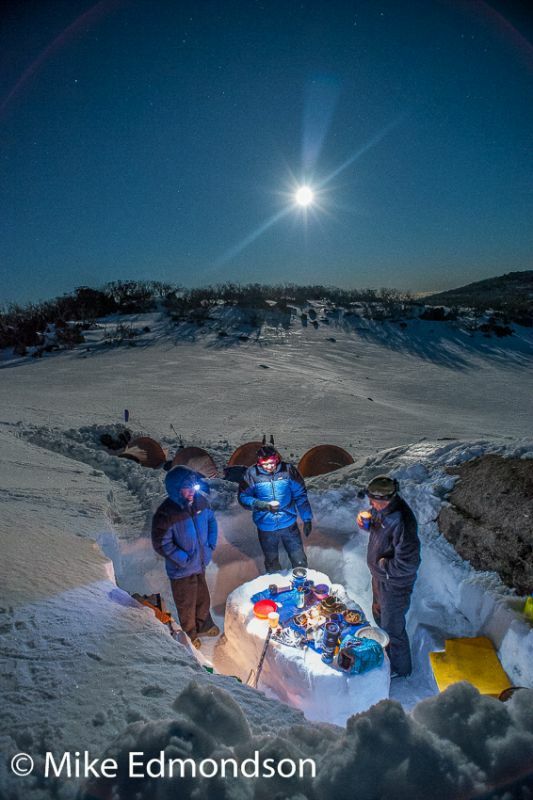 We highly recommend spending three days and two nights on a snow camping tour to learn how to camp in the alpine setting and in a relaxed way experience the wild beauty of the winter alpine environment. Checkout this testimonial by Altaaf: Altaaf joined me on a three day snow camping adventure last winter. 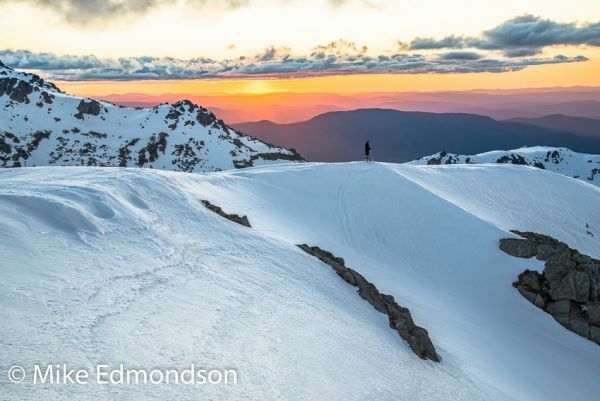 We experienced amazing sunsets and sunrises, summited Mt Kosciuszko and learnt snow survival skills. See his great photographs here - http://www.altaafkhan.com/snow-camping. Cost - three days: $650pp for 3-5 clients, $860pp for 2 clients, $1500pp for 1 client. If you book a complete private group of 5 walkers for a Camping Walk or 5-6 walkers for a lodge based walk I will give each customer a signed copy of my 84 page hardcover photographic book " The Australian Alps" valued at $30 each. ·Camping Equipment (hire gear is available as follows for three days) Thermarest NeoAir Xtherm sleep mat $35 pp, Macpac Minaret four season one person tent $60 per tent or Macpac Olympus four season two person tent $90 per tent, down winter sleeping bag and inner sheet $55 pp, overnight backpack & rain cover $40 pp, stove & food $120 pp or $40 pp stove & fuel. Please email me your name, phone number and preferred dates. A 50% deposit is required to secure your booking. Once this is done you will receive an information sheet including a detailed itinerary as well as clothing, equipment and training requirements to help you prepare for your adventure. You will also be required to sign a liability waiver. NB. 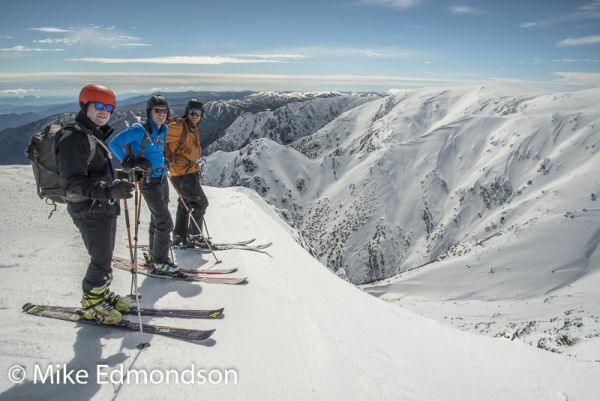 Customised snow shoe, skiing and walking tours can be tailored to suit your requirements. For example a six day scenic walk visiting peaks, glacial lakes, seeing Australian wildlife and historic stockmans’ huts. 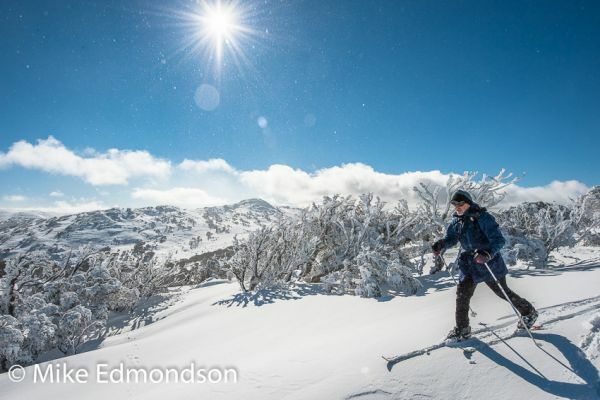 Another great challenge is to cross the mountains from Thredbo to Perisher via Mt Kosciuszko. Camping or lodge based options are available. Plus taking clients out on alpine touring skis and cross country skis as well as snowshoes.